If you want to understand what is happening in Baltimore, listen to Makayla Gilliam-Price and learn about her family. It was almost overwhelming to watch Makayla Gilliam-Price speak, and not only because of her clarity and strength. 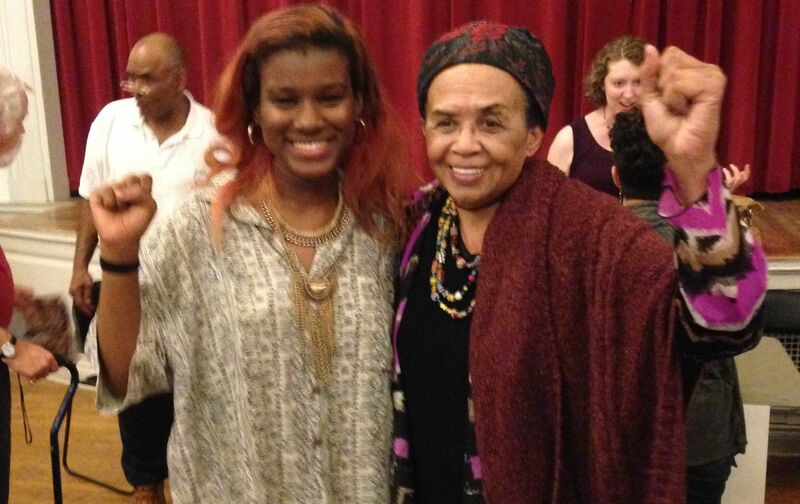 See, I had met Ms. Gilliam-Price before, but she had yet to become this powerful student organizer with shock-red dyed hair. It was the fall of 1998, and she was barely a baby. Over the course of that year, Baltimore was my second home because of a man named Tyrone X. Gilliam. Tyrone was on Maryland’s death row. He was also someone many of us believed to be innocent. Tyrone endured the long, indecent ritual towards execution right in the middle of Baltimore, the location of both the state’s death row as well as its lethal injection chamber. The Maryland death house, currently closed for business, was in a neighborhood defined at the time by disinvestment and dilapidation. Yet amidst the familiar urban decay, there was a brand-spanking new supermax prison equipped with the most cutting-edge death equipment the state of Maryland had to offer. It was obscene and it spoke volumes. The fight to force the state of Maryland to spare Tyrone’s life had been led by his sister Zelda and her husband John. As we would march the nonexistent distance from the neighborhood apartments to the death house, they held in their arms this baby girl named Makayla. Tyrone X. Gilliam wasn’t just a voiceless name or symbol to those of us on the outside, and not only because we knew his family. He was the inaugural participant of events we staged called “Live From Death Row,” where he called in to meetings packed with hundreds of people to answer questions about his case, profess his innocence, and describe life on the row. We knew him, as he developed politically and personally through these interactions with thousands of people he could not see. We fought, we marched, and we even prayed, but on November 16, 1998, Tyrone X. Gilliam was injected with poison as hundreds of us stood outside the death house. I will never forget that evening, as people from the neighborhood made their way out of their homes to stand in front of the only new building in the neighborhood and bear witness to a premeditated killing. Baby Makayla was not outside with us. The Gilliam-Price family kept her home as they mourned the loss of Tyrone, while we all waited fruitlessly for that 11th-hour cinematic reprieve from the governor, Democrat Parris Glendening. That blow is being felt in the Black Lives Matter movement and it is being delivered by Makayla Gilliam-Price. Makayla ended her remarks last night by saying, “We need to see the humanity in each other. Then we would be in a radically different world. That is all.” Looking on from the front row, beaming, was her mother, Zelda. It takes your breath away. The Gilliam-Price family would have every reason to treat Baltimore the way Baltimore treated Tyrone and leave it for dead. Instead, they are fighting to reclaim it and demanding their rightful place in a city that took their blood. It’s a place they have more than earned. The city of Baltimore has a brutal history. While it is tempting to see Makayla Gilliam-Price as the revenge of that history, it is also wrong. She’s not its revenge. When you listen to her message, you realize that she actually represents its redemption. This might seem like quite a weight for a 17-year-old woman to carry, but honestly, Makayla Gilliam-Price makes it look easy.